An Edinburgh butter merchant, Thomas Dalyell, who had made his fortune at the court of King James VI and I in London, built the House of the Binns between 1612 and 1630. 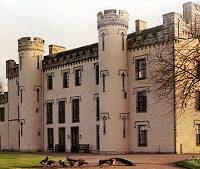 It has been the home of the Dalyell family ever since. The house is a good example of the early 17th century transition in Scottish architecture from fortified stronghold to more spacious mansion. Important moulded plaster ceilings in four of the main rooms were added in 1630. The house's fascinating collection of portraits, furniture and porcelain reveals the life and interests of one family through the centuries, including one of its celebrated characters, General Tam Dalyell, about whom there is a wealth of legends. Album of views of upper rooms with accompanying text for those who cannot manage upstairs. 8 out of the 10 rooms are on the ground floor. Outside the house the grounds provide panoramic views over the River Forth, a woodland walk and peacocks with character! Off A904, 15 miles west of Edinburgh.